Banter Bistro is a health-conscious restaurant and bar that serves as a community hub for artists, musicians, and lovers of life. In addition to tasty foods and beverages, Banter Bistro offers entertainment, art shows, music sessions, poetry readings, and more. 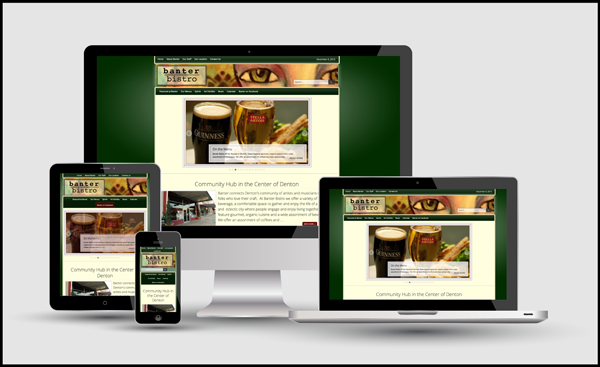 Websentia Web Services had a lot to display in a website for this client. And with recent technology shifts in the internet, we were faced with redesigning our own work to keep up with the changing times. This site is built in Wordpress using the Genesis-based theme Epik by AppFinite as its base. 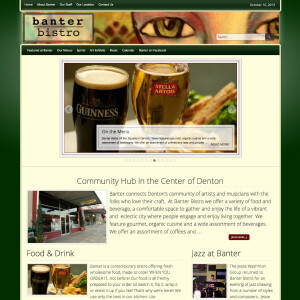 Added to that mix is a complete overhaul in appearance using responsive design to accommodate the high volume of mobile traffic generated by Denton’s Historic District evening events.